In my late teens and early twenties, the TV incarnation of Entourage was just pure fun, plain and simple. It merged the idea of friendship with the fantasy of LA and filmmaking and generated a few laughs per episode. I kept watching till the series’ end but it’s my opinion that after the fourth season, the show struggled to find what made it work and then went on to struggle to get it back, becoming a largely unfunny, uneven comedy-drama. And so we arrive at Entourage: The Movie, a full-length affair that sees Vinnie and the boys setting out to make a feature, only this time Vince is out to direct. The problem? He is over budget by a few million – and that’s just the tip of the iceberg. Though Doug Ellin directs competently enough, but when it comes to the writing, Entourage: The Movie feels like a bit of a non-event. There’s nothing really cinematic or grand to really justify a cinema outing for the lads and Ari. The story aims to go big with the idea of Vinnie directing but it never really feels larger than life. On top of that, Entourage doesn’t really do anything different. There’s not much of a progression to these lads, it all feels like a regular episode from the television series, only longer. Vinnie is still the same guy, even though his marriage from season eight lasted, what, nine days? E (played by Kevin Connolly) has a storyline involving his on-again, off-again girlfriend Sloane (Emmanuelle Chriqui) – who is pregnant – but their relationship has been so back and forth that it doesn’t really generate any romance or drama. There is a moment where E makes a few startling discoveries but this idea of exploring the drama and possible ramifications seem too much for writer/director Ellin and the film downplays any chance for new and interesting ground. 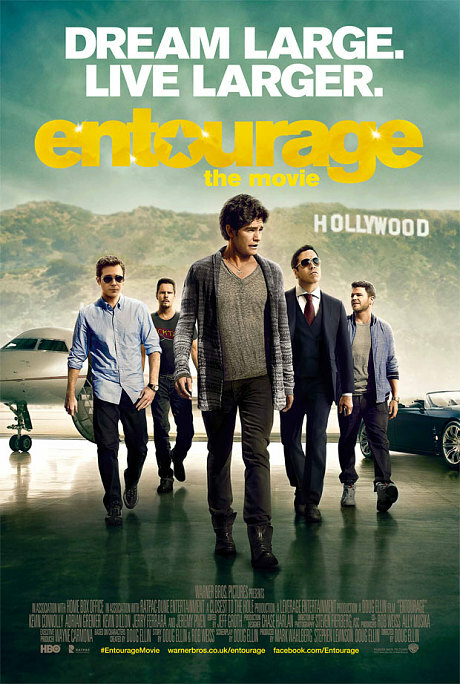 So – Entourage: The Movie is more the same of what came before, only with similar problems and an apparent fear to jump into different and exciting new territories. It’s still a story about friendship and film making in fantasy L.A, it’s still got its random cameos and it’s still uneven in its laughs and balance of comedy and drama. If this is your bag, then go for it – but I would’ve liked to see something on a bigger scale. I wanted to see it jump into something I haven’t this story do before, and with all of the sass that it had for Hollywood in its first season.